Do you ever feel like your life is missing something? Have you come up short in the pursuit of success? Are your relationships stuck in neutral? If so, you need to put the WOW back into your life! What's so special about WOW living and can it really be the answer to life's frustrations and dilemmas? 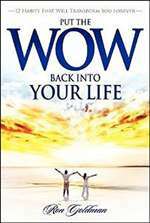 Put the WOW Back Into Your Life by Ron Goldman will not only help re-ignite the excitement for life you once had as a child, it will help you develop 12 breakthrough habits essential for WOW living. It's time to see how much fun life can be again! The 12 life-changing habits include: Doubting Your Doubts, The Will To Win, Living in the Zone, A Sense of Timing, The Power of Agreement, and seven more. In each chapter, Ron illustrates WOW living by someone who's lived it - people like NFL coach Tony Dungy, Olympic champion Michael Phelps, mega-billionaire Bill Gates, NBA superstar Michael Jordan, entrepreneur Estée Lauder, best-selling author Dale Carnegie, and many others. The principles of WOW living have helped countless people take their lives, relationships and businesses to a higher level. Put the WOW Back Into Your Life will help you reinvent yourself and awaken your God-given potential so that you can write your personal life story with a happy ending saying "WOW!" with unbridled hope and enthusiasm. RON GOLDMAN hails from a family of modest means-a family tied to traditions. The traditions that brought stability to his family also kept him from living his dreams until a special person came into his life. Ron and Diane are proof that dreams do come true. His journey from obscurity to phenomenal success has allowed him to touch people from all walks of life, helping them to realize their personal potential. Today Ron and Diane make their home on the beautiful island of Providenciales, Turks & Caicos Islands, B.W.I.